If you’ve ever had the wonderful experience of running in the rain you know that it can actually be an enjoyable experience. Aside from the pleasant and repetitive ambiance of the raindrops falling around you, those cloudy and bleak days seem to provide the perfect atmosphere for any runner. Turbulent winds and total cloud coverage keep you cool and the radiant sun at bay. The aroma and moisture that spreads through the air seeping into every pore of your body are almost reminiscent of the first spring dewing and quite relaxing and refreshing. However, should you be the type that doesn’t ultimately enjoy running in the rain but won’t let a little rain stand in your way, there are solutions to the struggle. Part of what makes these runs the most enjoyable or simply a bearable workout is an equipment we use to keep us warm and focused while exercising. With this best of list, I set out to find the best gear for your rear. I chose a variety of products that would be well suited to accompany you on your rainy runs and organized them to what would suit just about anyone’s needs. From running shoes to waterproof gloves there is surely something in this list that you will need to add to your running set up. You would generally expect to find this brand on a jacket and what may not be so surprising is that The North Face delivered a shoe that is a must-have for any rain runner. Much like their jackets, these shoes are waterproof and they accomplish this with the use of a breathable Gore-Tex membrane making these shoe ideal for rainy running. The sole of the shoe is comprised of an UltrATAC design that is made to grip any surface in wet conditions. The Gore-Tex waterproof membrane is a porous membrane that is used in the interlining of the shoe. This membrane has billions of tiny pores that will prevent water from entering your shoe on contact. This works because water molecules bond together and bead up, then roll off the surface because they cannot fit inside the billions of tiny openings. Furthermore, this membrane allows any moisture or sweat from your feet to exit because they are small enough to fit through this porous lining. 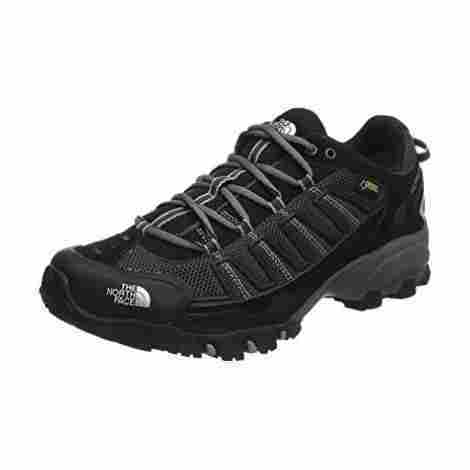 Included in the heel part of the sole The North Face added a rigid snake plate. This plate is designed to flex and bend around the terrain you're standing on much in the way your feet naturally do. This plate provides the flexible stability that is unparalleled in the running shoe industry. The success of any runner can be measured by the footwear they choose and the 109 GTX by The North Face doesn’t disappoint. As the number one product on this list, if you take anything from this page today, these shoes are phenomenal additions to your gear. The rigid snake plate heel and Gore-Tex membrane interlining make these shoes a formidable opponent to the elements you will encounter on your rain filled escapades. These shoes do have a higher selling point but it’s not uncommon for what The North Face has to offer. The uppers on this fine shoe are made of Gore-Tex which is a three layer fabric designed to keep moisture out and away from your feet. The Snake Plate sole keeps your feet stable on uneven terrains. Using a UltrATAC sole these shoes have many rubber outpourings that grip any surface and provide better traction control. Using a compression EVA mold the soles of these shoes are very durable and will last for a substantial amount of time. The insole on these shoes is quite thin. These shoes are quite narrow and should your feet be larger they may struggle to fit into these shoes. Running in the rain doesn’t have to be synonymous with getting soaking wet and the Precip jacket can certainly attest to that. 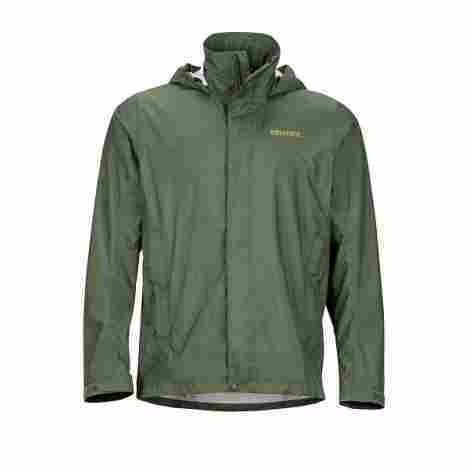 This jacket is lightweight, waterproof, and will provide extra protection from harsh winds. With a large variety of single and two-tone color options, these jackets are very accessorizing and can accommodate any wardrobe. The Precip Jacket uses a waterproof breathable shell that prevents water from entering your jacket. This jacket uses velcro cuff straps to prevent moisture from entering your hands and helps in heat retention. The Precip Jacket uses a NanoPro layering that is microporous coating designed to prevent water from entering the jacket. This porous membrane is very breathable material and was changed to be more air permeable than older designs. With the heat that our bodies can generate it’s no surprise that often times even the most air permeable jackets can’t keep up. In trying to combat the warmth your body can store, the manufacturer added a feature called Pit Zips. Pit Zips are a zippable opening that is found under your arm and runs along your sides that can be opened and closed as you need more or less heat. This ingenious design will help any runner maintain their body temperature, particularly on the warmer and muggy rainy days. Running in the warm rain can be one of the most wonderful events you can experience and like a double-edged sword, cold rain running is nearly the polar opposite. With the temperature of the rain, we run in being hit or miss having a jacket like this on standby will prove to be invaluable. The Pit Zips and NanoPro layering are very unique additions that help to combat your environment and the pit zips particularly are unheard of in most other jackets. This jacket falls in the upper middle priced range comparatively to other products on this list but is nearly a necessary amenity to cold rain running. Almost a staple of high-quality products this is developed and produced entirely in the USA. This jacket provides angel wing movement which is essentially full arm mobility. Very unique to running jackets, this garment allow you the ability to release or retain heat based on your needs. The DriClime chin guard will keep water from entering around your neck line while running. This jacket does not have any interior pockets which would be perfect for personal belongings. While running the hood can become a nuisance. Common sense would tell you that when you’re running in the rain, you’ll want waterproof socks. Right? After all, you opt for waterproof shoes, waterproof jackets, waterproof phone cases--so you should opt for waterproof socks as well, no? Well, no. 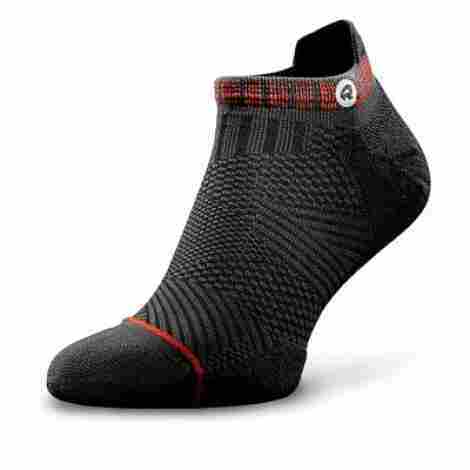 Most waterproof socks--while effective--are actually rather bulky, rather heavy. That means that your run can suffer. You may be uncomfortable, or slower, or your form can be thrown off. That’s why it’s better to opt for something breathable, something light, and something with superior moisture wicking capabilities to keep your feet comfortable and dry. If you’re looking for something long-lasting that guarantees quality, look no further. These socks have been constructed using 100% pure organic merino wool, which means it’s soft, light, and smooth to the touch. In addition to that, it’s functional too; merino wool is naturally breathable and can absorb up to a third of its weight in moisture. There’s nothing more aggravating than socks that slip as you run. You’ve perhaps been there. You’re running, trying to reach your goal, but you’re sidetracked the entire time, because you have to keep bending down and to pull your socks up. With this pair of socks, you won’t have that problem; its compression fit and superior arch support guarantees that it’ll remain secure and in place. With all the benefits this sock offers, it really should be priced more. As it stands, it’s more than reasonably priced; its cost reflects its value. It offers durability, breathability, comfortability, functionality, and it’s even antibacterial. In short, it’s a great buy. Nearly as important as the shoe you wear, the socks you choose to use while running can and will affect your performance. At first, I considered using a waterproof sock that would potentially prevent moisture from reaching your feet. Many of the waterproof socks I encountered were bulky, rigid, and would cause a feeling of swampy feet. Rather than taking that avenue of approach I chose socks that would work to keep the moisture away from your feet and would hold steadfast despite the presence of moisture. Many thin socks struggle to protect you from water or blistering. 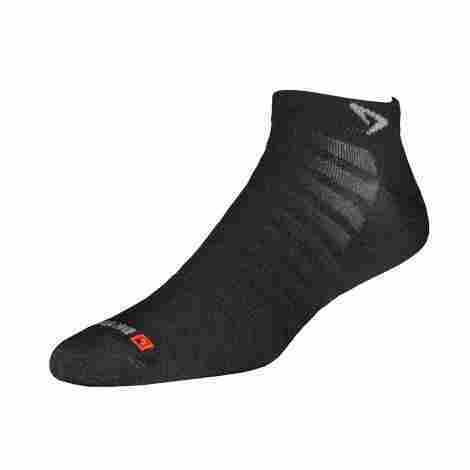 These Hyperthin socks us a dual-layered fabric design that works to pull sweat and moisture away from your feet to the exterior layer that is meant to push the water out and repel outside water. With the goal of remaining an extremely thin sock, Drymax went with a dense padding rather than a thick airy padding that would take up a lot of room and could cause problems with tighter fitting shoes. This dense design provides your feet with a stable and soft platform to run with that won’t cause friction or blistering. 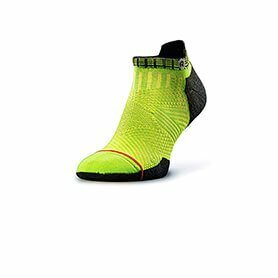 Considering the design traits and huge benefits that runners can experience with these socks their positioning on this list speaks for itself. When compared to your standard socks this single pair will cost roughly would you would normally expect to spend on six standard pairs of socks so they are more costly. The true value comes from Drymax keeping a runner in mind when developing this high-quality blessing of a sock. Whether you’re an extremely busy worker or just someone that enjoys using their phone for music during a rain-filled run, phones are being exposed to tumultuous weather more frequently. Furthermore, each phone is unique in shape, size and weight so finding a phone case that not only prevented exposure to the elements but would be capable of embracing any phone was my next challenge. This universal phone case is the perfect addition to your rain gear and will keep your phone dry even if it were to become fully submerged. Many cell phone cases use a rather rigid frame that wraps around your phone and is very specific to the type of phone you use when it comes down to the sizing. This universal case uses a pouch-like design that is embodied by a larger frame that is capable of holding numerous different phones of various sizes. This universal case uses a snap and lock access system that requires you to slide 2 different buttons simultaneously to open the case. This locking system will prevent you from accidentally opening your phone case at an inopportune time which could potentially cause damages. Phones are quickly becoming the primary access point for all your content and contacts. Protecting this asset from bad weather while you exercise can be difficult. 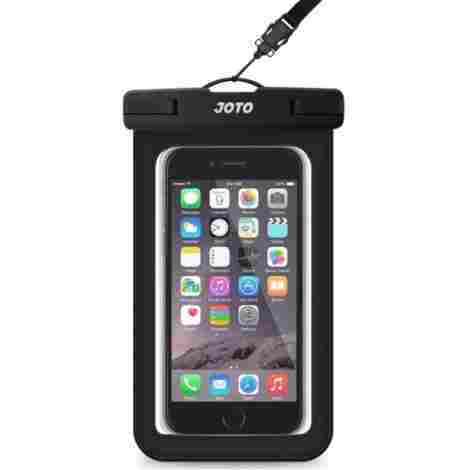 With today’s phones reaching prices in excess of a thousand dollars, a cheap and efficient case is the perfect solution for keeping your phone dry during your rainy run. If it even prevents your phone from breaking due to water damage in a single instance it will potentially save you in excess of 100x its own value. The universal design ensures that as long as you can get your phone into the case it is supported. The clear front and back windows allows you to take pictures or even selfies while its raining or even fully submerged. Including during your purchase is a neck strap that will allow you to carry your phone with ease and provide hands free access. The clear screens on this phone case are touch sensitive and you can manipulate your phone while it is inside the case. While the touch screen function works perfectly the home button may not recognize the material or even be capable of being used. The neck strap is rather thin and should it become caught does rip with relative ease. When running in the rain your legs seem to take the brunt of the water exposure. Not only will they get soaked by the falling rain but as your feet land in small puddles that water has a tendency to rush up your legs making sure to encompass your entire lower half. Columbia decided to face this issue head-on and produced a high quality and waterproof pair of pants. The Storm Surge is made primarily of nylon and polyester and can be tightened with the use of a drawstring. This allows them to adjust to your specific size and body shape while remaining firmly in place even during demanding physical activities. A very common problem with running pants is that as you move the waistband if not properly supported will sink and lower as your legs move back and forth. The Storm Surge pants use a combination of an elastic waistband that will naturally shrink to your size and shape and uses a drawstring to tighten during more demanding use. With a design that is used by nearly every waterproof product, you can find Columbia uses a three-layer fabric arrangement that will prevent any water from saturating and penetrating to your legs. Additionally, the Omni-Tech coating used on the exterior of the pants is stain resistant and will help to prevent the build-up of dirt and grime. With your legs already having to endure a substantial amount of stress while you run keeping them happy and healthy is a critical part of running in the rain. Having dry legs will prevent chafing and provide an all-around better workout. These pants are machine washable so cleaning them is as doing your standard load of laundry. 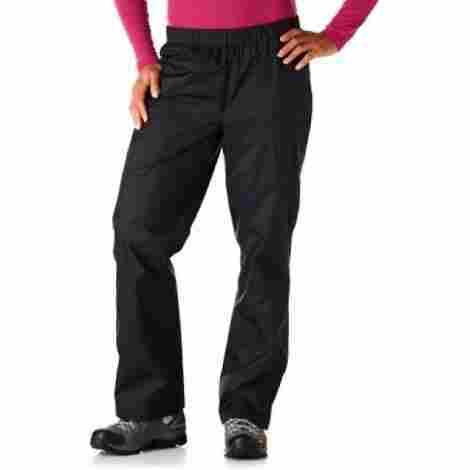 Coming in at an upper middle price point these pants have a very get what you pay for feel. While being more expensive than your common waterproof pants they make up for it with breathability and universal quality no matter the task. The elastic and drawstring waistband is like a dynamic duo that works hard to keep your pants firm but comfortably in place during your run. The omni-tech three layer waterproof system provides unparalleled breathability compared to other waterproof fabrics. The ability to be machine washed will save you plenty of time and money when maintaining these pants. All of the seams on these pants are fully sealed to prevent any water from leaking into your pants via the seams. The bottom opening near your ankle isn’t form fitting and after stepping in a puddle while running the water can shoot up into your pant leg. There is no inner lining on these pants and wouldn’t be well suited for colder rain runs. I’ll never forget when I first started seriously running as part of my regular exercise routine. My plan was to follow a trail and at the end arrive at a gas station that I would get a water bottle at and save me time by killing two birds with one stone. Mother Nature decided to intervene and throw a monsoon in my path completely drenching me and the money I would use to buy water. Swearing to never again make that mistake again and working to prevent others this same problem I present the Slimfold waterproof wallet. 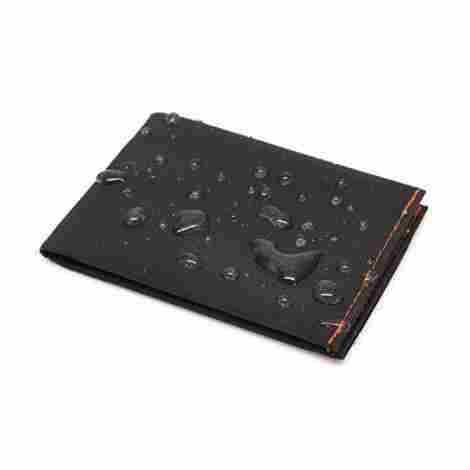 This slim wallet will easily fit in any pocket and is waterproof keeping any important personal belongings safe and dry during a rainy run or sweat drenching workout. This wallet uses a very simplistic bi-fold design that uses a full-sized money pocket and dual-sided card storage slot setup that can hold up to 8 cards. Folding in half allows this wallet to be discreetly stored anywhere you could fit a folded bill. The rain getting to your credit and debit cards, ID’s, cash, or other important documents is the last concern you will have with this wallet. In the production of this wallet, Slimfold used a mixture of fabrics and leathers that they likened to a mixture of Gore-Tex and Kevlar that is waterproof and extremely durable. If you tend to carry any cash or cards around with you even while running this wallet is more of a need than a want. While more and more banks are making new cards on the spot, there is still a large number that still makes them off-site then mails them to you. This will cost you more time and potentially money. Slimfold used some of the best materials to produce this wallet and it is represented in the price tag. This wallet will cost a pretty penny up front but the endurance and durability help to level the value. With the ability to hold up to 8 cards and 12 bills this wallet is the epitome of big things in small packages. This wallet was design with RFID technology and will prevent anything or anyone from accessing your cards personal information no matter how close they get. The extreme micro size of this wallet makes it the perfect addition to your running gear and will fit in nearly any pocket. There is multiple different color and stitching options provide a small bit of customization. Exceeding the capacity of the wallet can stretch it out and work to malign the product from its basic function. This wouldn’t make a good daily use wallet and is very limited to keeping personal belongings safe and dry while running in the rain. While it is a controversial and debated subject amongst cardiologist the general consensus is that your target heart rate is a good guideline for how far you should push yourself safely. 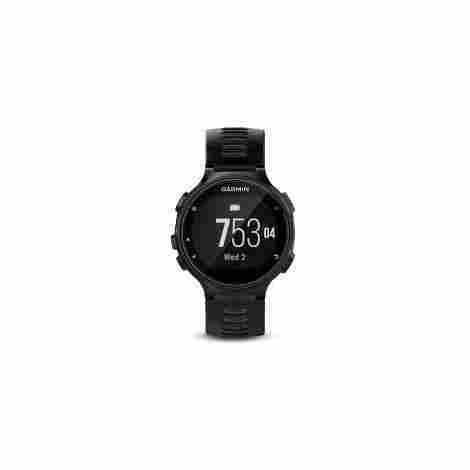 The Garmin Forerunner 735XT is one of the best ways to keep your heart rate in check even during a run in the rain with its waterproof design. This watch can be fully submerged and even be used while swimming. This watch uses the pulse in your wrist to monitor your heart rate allowing you full mobility during your run. A good way to ensure you're keeping your exercise routine dynamic is comparing your workouts and changing them regularly. Garmin made that simple and easy by giving you the ability to save and compare your previous runs allowing you to compete with yourself and get your best possible workout. This watch comes with a unique serial number that is registered when you purchase this product. This serial number can be used to locate the watch and will prevent any theft or find the product should you lose it. Staying safe while exercising your cardiovascular system is a very important part of running. This watch is quite capable of identifying your target heart rate and keeping you aware of it while you exercise. As the most expensive product on this list I would really only recommend it to someone that was entirely dedicated to running passionately and was striving to outperform themselves regularly. Using the pulse from your wrist keeps this watch in a comfortable and easily accessible position compared to under the shirt straps that most heart rate monitors use. This heart rate monitor will monitor your heart rate throughout the entirety of its use and even do so while you sleep and will establish your resting heart rate. The forerunner uses an activity tracker and this will allow you to compete in an arena of one and make the most improvement you can out of each rainy run. The watch is completely and fully submerged and could even be used while swimming ensuring a little rain is the least of your concerns. The extremely high cost will keep a regular and normal runner from ever considering using this product. Garmin has yet to work out all the kinks and there is some bugs in their software that make use more difficult. Many spring showers or rainfalls can occur even on sunny days with a clear sky and often times this is accredited to the wind carrying nearby storm droplets. While many people may recommend sunglasses while running they can tend to bounce and will generally block some part of your peripheral vision. This Watertight cap will rest securely on top of your head while you run and keep the sun out of your eyes and rain off your face and head. Columbia uses their Omni-Tech nylon and polyester shell that is waterproof and breaths well. Columbia included a mesh lining on the interior of this cap that lays between your head and the exterior shell. This lining works to allow breathability to the cap by making small gaps that can escape around the sides of the cap. The larger bill that is added to this cap provides increased sun protection and more rain off your face. This bill isn’t bent at the same angle as a standard baseball cap and this keeps the bill from interfering with your peripheral vision which is particularly useful if you run in areas with vehicles or other pedestrians. Exactly as described this cap will keep you seeing clearly while running in the rain sunshine or not. The mesh lining provides added comfort and breathability that keeps you cool while wearing this cap. This cap comes in at a much lower price point and considering the high-quality materials the value is rather high in comparison to other products featured in this list. The hook and loop restrap provides a firm fit and adjustable comfort that fits your heads specific shape and size. Much like their other products this hat has fully sealed seams that will prevent water from penetrating through the seams. The larger bill keeps water droplets and the sun off your face and out of your eyes. The interior mesh lining keeps to the of your head warm and works to free any trapped warmer air. This cap needs to be hand washed which means more maintenance. The hat seems very shallow depth wise and this can cause it to sit awkwardly should you have a larger head. Running in the rain can take a toll on your body, and in particular your hands. When your body gets cold it naturally responds by pulling in blood from your extremities and keeping your core warm. While running in colder rain Trim Fit produces a durable pair of running gloves that will retain the heat around your hands and keep them warm during your run. They use materials that will transfer the conductivity from your hand allowing you to use touchscreen devices. Many running gloves I’ve run across would fray and tear at the stitching after water contact. Trim Fit Life use a nylon thread reinforced stitching that will keep from fraying and tearing during use and with water contact. The digital age is fraught with peril and even on your runs in the rain advertisements find a way to interrupt your music and concentration with a popup and exceptionally long commercial-like video. These gloves have a conductive finger pad at the end of each index finger that allows you to close those pesky ads and anything else you need to on your phone. 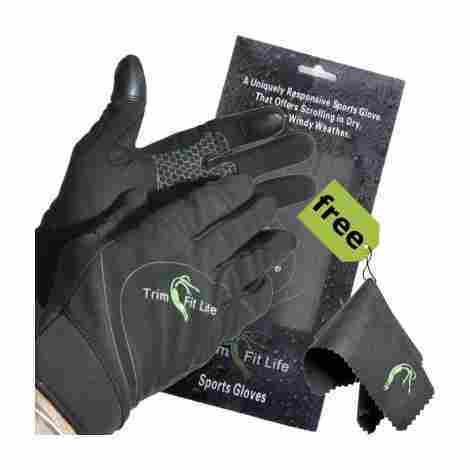 Trim Fit Life didn’t stop at just a waterproof glove for running, with the added features like a 4-way stretching fabric that provides mobility and the silicone printed grip for grasping objects this product provides the full experience. These gloves are in the very low price range so any runner can add these to their shopping cart on a budget. The ability to manipulate your phone while wearing these gloves is a blessing and major selling point on these waterproof gloves. The reinforced stitching keeps these gloves from fraying or ripping due. Using adjustable wrist straps these gloves can be adjust to match your size requirements. Using a 4 way stretch fabric these gloves won’t hinder your hands functionality. After the original purchase the gloves can be stiff and will need breaking in. The wind seems to find a way to penetrate these gloves. In selecting these products a very important aspect that needed to be available as they needed to be waterproof. This was a key trait I selected for anything that was relating to electronics or the storage of valuable personal belongings that would be carried during a run. So you can rest assured anything that is on this list will be comfortable with rain. Another element you must contest when running in the rain is generally the wind. This element can take an already cold rain and amplify the temperature making it the worst run of your year. Many of the fabrics on this list are waterproof but what isn’t commonly known is that if a product is waterproof it is inherently windproof as well. Many of these products will work to keep the wind at bay while you run. Being that it will at some point get what when choosing the products for this list I needed to ensure that the presence of water would not only be incapable of damaging it but able to do so without hindering its performance. The way these products works will not be affected with by water in any way other than making them wet. The bouncing and jostling created while you run is sure to send anything you happen to be wearing or carrying scuttling around in random directions. I tried to pick products that would be able to withstand the movement you generate while running without causing any issues for any runner. You already have a task at hand the job is simple and all you need to is run, right? Sometimes that is easier said than done and staying motivated to run particularly in the rain can be challenging. From a way to access your music to being able to manipulate your phone the products in this list were selected for their ability to assist you in running as much as possible. No one wants to be the person that takes their cell phone and places it in a waterproof case just to find out that the case did absolutely nothing to prevent water from destroying an overpriced phone. These products not only had to stop the rain, they needed to do it every time you needed it. With this in mind, I included products that would remain as consistent as it was the day of purchase. Time and time again we end up finding products that look amazing and use a high-quality picture to present a seemingly perfect product that won’t surrender even during the most demanding use. Trying to save you from this hassle I selected products that only used highest quality materials in their development. As with almost every type of item, there is a large selection of products to choose from and the best way to distinguish them is from their brand. Branding is a major part of every industry and can help to determine the product of a quality before you even see and feel the item. By using some of the top brand name items I was sure to include only brands that were synonymous with reliability when making this list. The open and free markets we trade inbreed very interesting outcomes and seemingly create an environment that is survival of the fittest for the products we purchase. The lower quality and poorly designed products fall by the wayside and plummet while the better items are pushed to the forefront and blessed with a satisfied and often recurring customer. While some are mandated and tested generally this environment is where industry standards are formed and are an unspoken way of doing business. Each one of these items was selected for a purpose that would assist you in running in the rain. From the headphones for music to the rain pants that keep you dry I tried to focus on what the purpose of the product was and if it were capable of fulfilling its intended purpose. I carefully handpicked each of these items as they exceeded what their intentions were original. With this list being more geared towards a specific event rather than a specific line of products I made it my mission to find a diverse group of products that would be well suited for running in the rain. I chose articles of clothing, electronics, asset storage, and any products that would help to improve your performance. How durable an item is generally varies based on the amount of maintenance that is required for that item. Often times this maintenance requirement can become more of a burden that it is worth. The products I present to your require very little or no maintenance other than what you would commonly expect depending on the product. Sometimes the only price tag we see is the one that’s associated with what you pay at checkout. Not apparently obvious is the upkeep cost that a is associated with a product and in some instances, this cost exceeds the value of the product itself after a short period of time. Many of the products I featured use fabrics and with that comes the potential for tearing or ripping. The smallest tear can compromise the integrity of even the most durable fabrics. With this at the forefront of my mind, I tried to select fabrics that were elastic and would stretch rather than tear. Part of what makes a great product is the assurances and the knowledge that the company producing them stands behind their product. Not only is it a good policy but it increases the value exponentially by ensuring you experience a long-lasting product. Many of the items I’ve chosen included limited or other types of warranty that assure your investment isn’t a waste. The tiny bits and bobs that are added with your purchase but not expected can often make your day. Perhaps they shoes came with another set of laces or your headphones had a carrying case these innocuous items add a little something special to the value. These little amenities played a small role in the placement of the products I selected. No matter your income the affordability of a product was a key trait I tried to regulate. When a product has a particularly high cost I try to closely analyze it and see what about the product can cause that type of price inflation. Furthermore, I compare them to other products of a similar design with a lower price. If there is no apparent reason as to the mark up I generally avoid those products. I organize this list based on numerous different factors and variables but I also place the items by relevance. If technically an item has more features but isn’t as suitable for the proposed task I place it below the more relevant item that is better for the job. The final aspect I take into account is how the price is compared to other items on this list. Q: How accommodating is the sizing on these products? A: Some of the products on this list are one size fit most while others will require you to select a size that best fits you. In selecting them I tried to pick products that could be used by anyone. Q: Are the waterproof products breathable? A: The waterproof products I selected generally featured a three-layer design that used a breathable but waterproof membrane and was specifically suited to being air permeable. Q: How heavy are the Bluetooth headphones? A: The Bluetooth headphones are very lightweight coming in around .16 ounces combined with the wrap around ear loops they will adhere to your ears while running. Q: Can the phone take pictures through the case? A: The universal phone case is made with a two-way clear plastic screen in which you can take front facing and selfie style photos. You can even use both underwater however it is recommended that in deeper waters you use a button that isn’t on your screen as the pressure will affect the touch screens performance. Q: Do the waterproof pants have pockets? A: The Columbia Storm Surge pants have 2 pockets on that are closed using a metal zipper that is on the inseam of the pants. These pockets are standard size and will keep its contents dry. Q: How many bills will fit comfortably in the wallet? A: The slim fold wallet can hold up to 12 bills and can hold up to 4 different cards. Compared to other wallets it has a smaller capacity but the size and slim design limit this wallet in those regards. Q: Can the watch actively monitor your heart rate? A: The Garmin Forerunner will actively monitor your heart rate and display it and other readings directly on your watch face keeping you informed throughout your exercise. Q: Is the cap one size fits all? 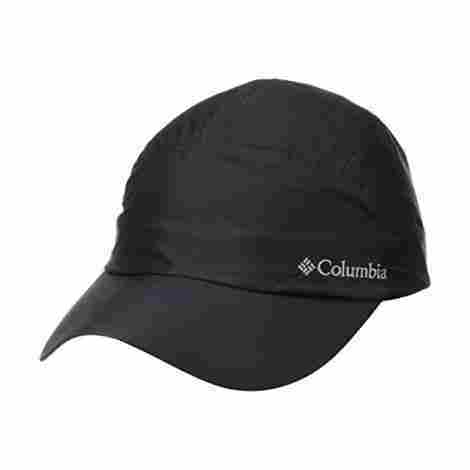 A: This cap by Columbia uses a rear fastening strap that will adjust and hold the cap in place all while matching the specific shape of your head.